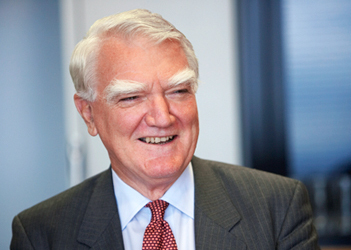 The former Chairman of Royal Dutch Shell, Sir Mark Moody-Stuart is Chairman of the United Nations Global Compact Foundation and a Board Member of Saudi Aramco. In EMG’s latest thought leadership interview, Sir Mark talks about his views on global challenges, corporate governance and CSR. What do you perceive as the most pressing sustainability challenges we face today and how can businesses play a role in addressing these in a way that also makes sense for business? As the new Sustainable Development Goals have just been agreed by states around the world after lengthy consultation, it is difficult to highlight one. On the other hand, since they highlight so many things that society has to address, it is necessary to prioritise somewhat. Clearly the climate challenge is one area. The nations of the world have agreed in Cancun that it is important to limit potential global temperature rise to some 2 degrees centigrade, and yet even in the upcoming Paris agreement the collective commitments fall well short of achieving this. If we are to achieve real change we need carbon pricing to drive investment in the right direction. So one thing business can do is to promote the rational pricing of carbon. It is only through this that we can achieve the right incentives and discourage investment in high carbon fossil fuels such as coal while encouraging natural gas as a transitional step to a truly low carbon environment. Carbon pricing is absolutely necessary if we are to be able to develop Carbon Capture and Storage (CCS) in the interim. However, equally, something which is not highlighted in the SDGs very much is the need to combat corruption, which in my opinion is a bigger market failure that that of climate. Unless we address this and sound governance we will not be able to handle the other challenges. Why do you believe reporting on CSR is instrumental in terms of accelerating CSR impact? What do you believe can be done to increase the number of companies reporting on CSR? Few problems in the world can be fixed by one part of society alone; we need cooperation between different elements, for example between business and civil society. If this cooperation is to take place we need to build trust. Trust requires transparency and truly open and honest reporting, which covers the problem areas as well as other challenges. Open and comprehensive reporting is essential, but it is not easy. There are many organisations asking companies to report on specific items. For this reason convergence is important. The drive behind the Global Reporting Initiative was to have something with standardised indicators. This has been successful, but companies are unnecessarily discouraged by the large number of indicators. Somehow they feel that they should use them all, overlooking the materiality principle. You only report on what is material. For the same reason the reporting required by the UN Global Compact is fully aligned with that of the GRI. You really only need to report once, and it is quite simple. Personally I think that if a company goes to the trouble of reporting comprehensively it is worth going a step further and making sure that the reporting is verified. Reporting is no good if no one trusts it. However verification is not essential, although in my mind important. What roles can companies such as Shell and Aramco play in terms of environmental challenges and how do the challenges and opportunities compare, looking at Shell versus Aramco? We talk about efficiency versus effectiveness; what opportunity is there for an oil business to be effective, not just more efficient? In this we go back to the need for carbon pricing as a very important market mechanism. Both Shell and Saudi Aramco have similar objectives in being very efficient and technologically advanced companies using technology to deliver efficiency. But there is a fundamental difference. Aramco is the steward of the Saudi national resources and the main provider of funds for national development. It is important for Aramco to preserve the value of the nation’s hydrocarbon resources for future development for as long as possible. In doing this they have an advantage in that the Saudi resources are lower cost than most others so they are likely to be the last barrels produced. None the less, the difference between a national oil company and an international oil company is important. How do you see the role of companies such as Shell/Aramco in terms of the development of renewable energy? How do you think these companies will look 50 years from now, and what will the priorities be? Again there is a difference. As a steward of natural resources for the development of the Kingdom, Aramco has as much incentive to develop renewable energies such as solar, with which the Kingdom is much blessed, and wind energy to continue to provide a resource base for national development. With an IOC, the drive is to make sure that the business model is adaptable to future constraints and demands. This could be in biofuels or in something that makes use of the global service station network which might or might not involve energy. In a way the choice for Aramco is easier. What do you see as potentially the biggest market opportunities for the GCC? The GCC is already working on two of the big opportunities. One is as a travel hub where they have a locational advantage. Currently this is a huge advantage. But it is worth looking at the history of Shannon in Ireland and Gander in Newfoundland. Both of these built on their locational advantage for the transatlantic trade when planes had to refuel to cross the Atlantic. That died with longer range jets and both airports are now historical relics. A more potentially lasting opportunity is in finance and trading. But we should not forget the high insolation values in the Gulf which make solar attractive if we can overcome the problems of dust from the desert on the collectors. What do you think is needed to make the principles of the UNGC mainstream? What do you see as the key achievements of the UNGC so far, and what do you think needs to be done to scale up the uptake of the UNGC? The UNGC has three important differentiating characteristics which separate it from excellent organisations such as the World Economic Forum and the World Business Council for Sustainable Development. It is based on the universal values of the major UN conventions on human rights, working conditions, the environment and anti-corruption. It is inclusive for large and small companies and also for civil society organisations and labour. Lastly, it is committed to transparent and open reporting – if you do not report you are expelled. None of the other organisations has these three elements in their DNA. If I look forward to the future of the UNGC it will be important to involve many more companies in many different countries. I think we can be quite proud of our over 8,000 business signatories, which is probably less than ten per cent of the major truly international companies. There are hundreds of thousands of nationally-based companies and literally millions of small and medium-sized enterprises which provide the bulk of employment in most countries of the world. We will only truly make a transformative difference when we engage with all of these companies in all countries around the world. One of the great strengths of the UN Global Compact is its Local Networks. It is not enough for the Global Compact to engage only in New York or Geneva, or indeed for global companies to operate and engage only in their home markets or countries of domicile. To achieve a more sustainable world, companies of all sizes, both international and national, need to be engaged. For this reason Global Compact Local Networks exist or are in the process of development and formalisation in almost a hundred countries. These Networks are the only way to bring together companies of all sizes, from small or medium-sized enterprises, with larger national and international companies and the local affiliates of global companies. The Local Networks focus on national priorities and issues, whether they be human rights, working conditions, the environment or corruption. They do so in a national context but are informed by the global principles of the Compact. This allows the principles to be implemented in a culturally sensitive way. At the same time, in line with the philosophy of the Global Compact, the Local Networks also involve local civil society organisations and labour organisations. What do you think governments can do to step up to the global challenges we face, in the GCC and more broadly/internationally? There is much to do for governments. They could put in place the frameworks for carbon pricing, for starters, and also OECD governments could look at their obligations under the UN Convention Against Corruption to identify and pursue the large amounts of corrupt money from other countries squirreled away in their banking systems. They could update the international tax agreements which were agreed decades ago in a different world and which are no longer fit for purpose. But we should not be too hard on governments. In democracies they can only act with the support of the population and the support of business is also important. We in business need to realise that we should not howl that the competitive position will be damaged or that cost will rise every time a government takes a leadership positon. We need to work with civil society to support governments to do the things which society needs. Business needs to put on its societal hat and support sensible regulatory frameworks.